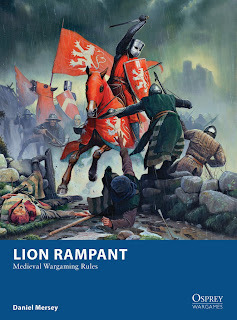 Some kindly soul set me a link to The Wargames Guy's podcast review of Lion Rampant. This is a nice overview of the rules, and its good to receive a new review a couple of years down the line from publication. It seems as though Lion Rampant is still a popular game, which is reassuring to know! And indeed things go somewhat full circle here. Way back in the late 1990s (I think), I reviewed Chris 'The Wargames Guy' Parker's own medieval rules, Day of Battle, for the Society of Ancients' journal Slingshot. I've not played the most recent version of the rules but reviewed the old edition positively. You can grab the current version of Day of Battle HERE.